Thanks so much for all the good thoughts coming Della’s way. She is hanging in there, and Jane is a delight. There is something about baby cows that is so endearing. 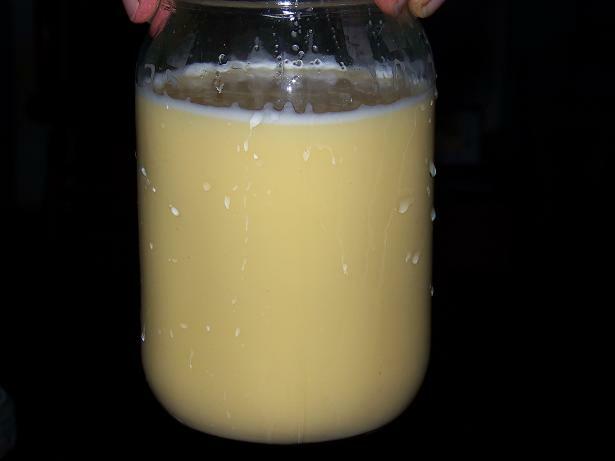 It’s hard to explain the thoughts I have that surround the idea of home dairying. I do know how much we missed having the baby calf to fuss over and train when Della lost her twins, we had two others to raise (Susie and Ty) but somehow it wasn’t the same. We were all just a little sad. 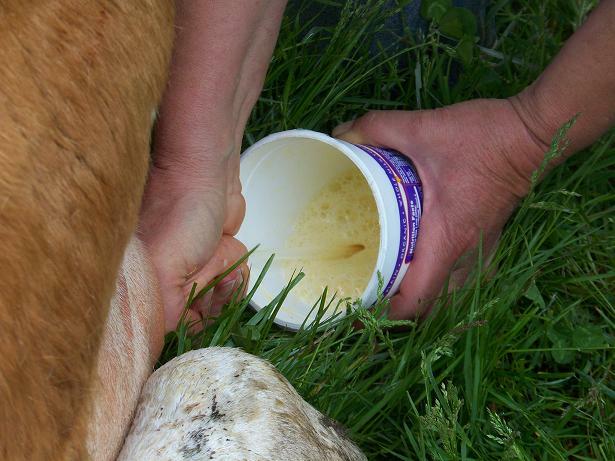 It brings a different dimension to the daily chores because the home dairy is so important to the farmstead. I always say the milker/milk cow relationship is not something to be entered into lightly. Because there can be hard times. This is one of them. There are several schools of thought – make decisions based on pure economics or make them based on pure emotion. I fall somewhere in between. And here is where some might disagree. 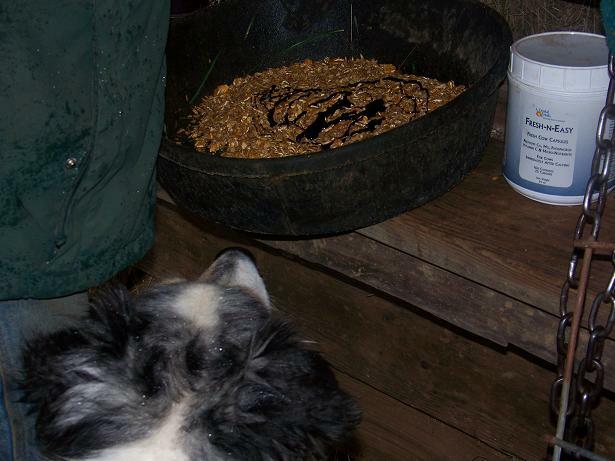 Having livestock isn’t always the rosy picture that is presented in the story books. I was raised with the culling mentality that when a cow fails to deliver a live calf, (for any reason) that is the omen to cut your losses. Thinking with my heart last year for Della I made the decision to not cull her, and to rebreed her, gambling that I would be right, knowing that something like this could be the outcome. Culling her was out of question for me, since that would be like sending Trace to the pound. I cannot bring myself to do that. But the other side of that is that I have to see her struggle at the end, and own my part in that. Della is healthy to a point, but she is old. I’m not into the dramatics of valiantly saving her, which may sound cruel, but animal ownership means also being responsible for the quality of life or death at the end too. Sometimes they just don’t get back up, because they can’t and that is it. She is getting food, water, constant attention, homeopathy, drenches, oral CMPK, and conventional pain meds & steroids to help in case there is calving paralysis. But I also have other cows that will be calving any day, Jane and many other things. Blogging makes this worse, because it is another path I have went down that exposes a person’s vulnerability. I feel as if you all know Della and are curious. So I owe that to you as “friends” who have got to know her, to keep you informed. But the other side of that is respect for my family and the decisions we have to make as a whole. I wish Della could live forever, but like others before her she will go at sometime. I am just not sure when that will be. This is what buying your food from the store insulates you from. 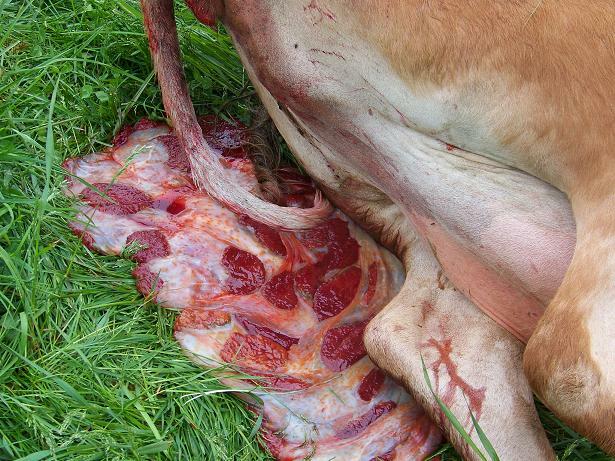 Every day a farmer somewhere is making a decision and dealing with life or death like this. Would I ever consider not drinking milk, or eating meat so I wouldn’t have to go through this? Never. Having livestock no matter what the outcome has enriched my life, and our land, I do not regret one minute I have ever spent any time raising livestock. I abhor zoos, and do not want to live in one. For them to live we must find a practical life for them. Enough said – I hope. Somethings did go right though. Della passed the placenta completely within an hour. She came into her milk. 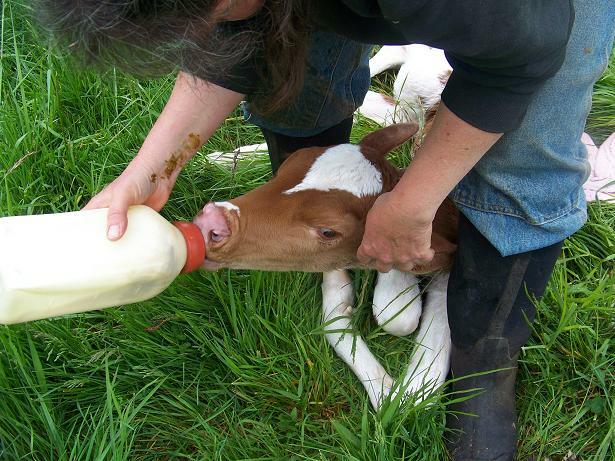 Jane had her first drink, just moments after I milked. And I have been able to milk her some each day. Amen, and sending your good thoughts for right action. I know it’s a hard decision to make. We had to put a calf down several weeks ago. All part of farm life. Prayers for wisdom and peace for you, and for Della as well. Congratulations on Jane! Living fully with animals is such a mixed blessing. Life and death and hard decisions are truly part of all of our lives, but we are so good at ignoring the hard parts…. When we brought our puppy home I kissed him and said welcome to live and die here. I hope I will be able to keep my promise. Wishing you the best for you and Della. Good luck with your decision! We lost our percheron Bill back in the fall, and were happy to not have to make the decision. Best wishes, we are pulling for all of you. Yes, your relationship with Della is clearly not the same as with most of your other animals. She is much more a member of the family like the dogs. Thank you for sharing with us. Wishing all of you good fortune in her recovery. Nita – I have been thinking of you and checking often for an update…wow…thanks for sharing all this. I’m sure many of your readers, me included, have been through tough times with livestock and pets. It has helped me in the past to know I’m not alone. Della looks quite comfortable and Jane is just beautiful. I had to laugh at the picture of the afterbirth. A long time ago when my boys and I had milk cows, son Jeff who was 12 or 13 at the time, gave a very graphic description to his entire health class, of the placenta (they were studying HUMAN reproduction at the time)…said it looked just like pepperoni pizza. His teacher couldn’t wait to tell me that one 🙂 Hoping for the best for you all…COME ON DELLA!! Raising livestock is hard. There are no easy answers and it sure as hell isn’t for the faint of heart. I remember when I was little and our cow Rosie got down and couldn’t get up. My grandpa loved that old cow and it was a hard decision to let her go, but it was the right one. The bleeding hearts just don’t understand that there are so many worse things in life than a humane and dignified death. Blogging exposes you to lots of uninformed though well intetioned folks. Do what you have to and God Bless you all! Life goes on and it’s a nice blessing that you got a heifer calf out of her. A goodbye gift so to speak! I truly hope Della gets up all right. She really looks pretty good to me, bright and eager and eating. All very important in the cow scheme of things, especially the eating. Here’s hoping she gets bored with lying down and gets back on her feet real soon. I have nursed any number of cows that got down for one reason or another and for every tragic ending there are always some good outcomes too. Alan loves to point to Camry, whom we almost lost as a first calf heifer. She was down for days and then one day when he went up with her hay and grain and water she hopped up to greet him and never looked back. Best wishes anyhow…from our farm to yours. PS, sounds like you are doing every single thing that you could be doing for her. I am impressed. Sweet Della … she’s loved by so many. Do the dogs realize what’s going on? Are they hanging out with Della or are they coveting her feed? Jane is a doll. 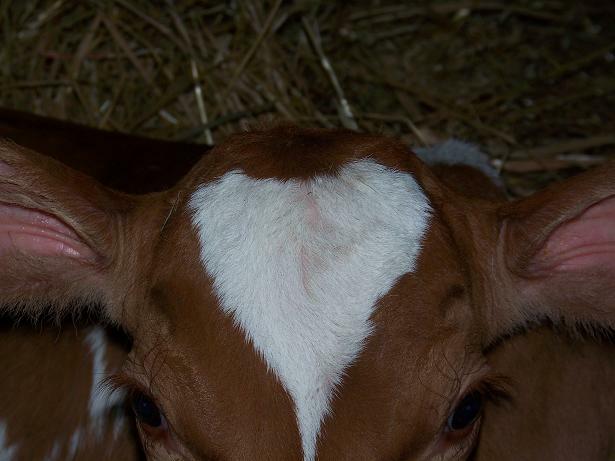 How appropriate that Della’s baby has a heart spot! How did you pick Jane’s name? Thanks for posting the video. Sending good vibes your way. You explain the process so well and take ownership for it. I admire you tremendously. Jane is beautiful and I hope that Della heals quickly, but if she doesn’t, I’m glad she won’t suffer. I have no criticism of you whatsoever. Your animals are fortunate to have such a humane and caring owner. What more could they ask for? I’m thankful there are people like you in the world, caring, yet realistic. I cannot add more than everyone else has, but I do wish you, Della and Jane (and the rest of your family) well. 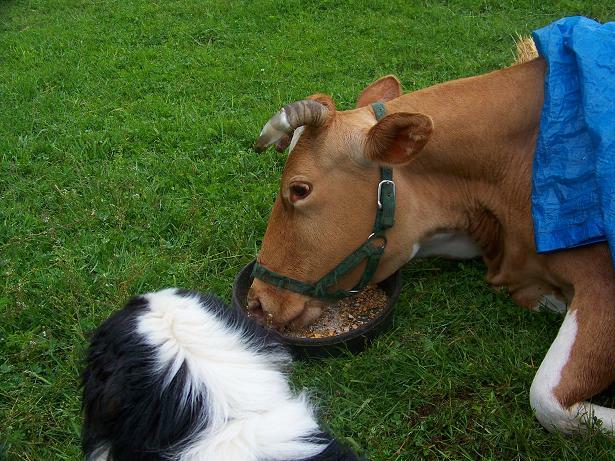 There IS no more special bond than that of milker/milk cow. That being said, it is always best to do the most humane thing. I can appreciate – and have often – your bravery in blogging what goes on in your life. You have my utmost respect. Jane is very cute, love that heart! I do hope that Della will get up and get well soon. I do understand the way of life and the decisions that you and your family will have to make. Best wishes to you. I can not imagine what you are going through. I don’t have any animals right now. From all that you have written though, I know that you will do what needs to be done and it will be the right thing. Your love of Della and all your animals shows through your words and pictures. I will be thinking good thoughts for all of you in the coming days. You are correct – animal ownership is not for the faint of heart! Jane is just adoreable and I have confidence that you will make the right/best decision. Thank you for sharing not only the sunshine but the rain as well. This is so true about the responsibility of having animals be they farm animals or pets. You need to be able to make the tough decision for the comfort of your animal and put aside your feelings. I see so many people that drag out their pets lives way past the point of humaneness just because they can’t bear to let go. At some point it becomes cruetly. Sadly too many people are like this, then insulate themselves from the realities of eating meat/dairy/eggs/poultry/pork/etc because they don’t want to know or don’t want to admit what really happens or where their food really comes from. As a result, the animals that are feeding these people lead a terrible life compared to animals like yours that are raised lovingly on a farm or animals that are hunted. I have no doubt about how wrenching a decision this is for you, but as you said, you must do what is right by Della and your family. And thank you for underscoring the point that this is part of the food process. People forget very quickly how physically, financially and emotionally trying a farmers life can be, when all they see are pristine plastic gallons of milk and shrink-wrapped steaks in their grocery store. I’ll keep a good thought for you, Della and little Jane today. Take care! I’ve been away and I am delighted to find out Della had a baby girl! I am so sorry for Della and I hope hope hope she gets up and becomes the good mother you know her to be. I’m thinking of you and Della and sweet baby Jane. Honestly, I don’t think you need to explain this to us because the past few weeks of posts and your anxiety over Della (Not Milker No 351 or whatever) came through in a big way. I know you’ll make the decision you need to make. I also know it will hurt if you have to make the choice to cull. And I will certainly not judge, but give as much pixelated empathy as I can. We do what we have to do, but that doesn’t make it easy. My heart aches with and for you Nita. I’m sorry that Ms Della isn’t doing well. I hope and pray that she does get up. I’m sure you’ve thought of raising her in a sling. Whatever you decide to do I’ll support that decision, just as you’ve stood by me in the decisions I’ve had to make. Give her a few days. She’s on clean grass and looks like she is eating, that’s good. Lots of fresh drinking water, 1st cutting hay and good footing for when she starts trying to get up are the best you can do for her right now. Having the calf nearby will encourage her. I predict Della is going to be up and doing fine soon. I appreciate your care and the love you give all your animals. Thank you for explaining what is really going on with Della. I know that you will do what you must and I know that will not be easy. I think we all love Della. She has given you the best gift, her baby calf, Jane. This is so sad. We do understand, though. A few years ago we had a cow that we raised from a newborn. She was a great cow, the lead cow, the herd babysitter and she adored Terry. She also had a white face so as time went on (I could tell you lots of stories, cute stories) she developed cancer in the eye. We tried the shots and many other things, but the cancer kept coming back. Finally it was time. She knew it too, there was no other choice. It was a very time for all of us, Skipper included. As everyone else here has stated, I also appreciate your honesty about raising animals with care and respect for what they give us. I also know you will do whatever needs to be done, because of that respect. My best wishes go out to you and Della and Jane. Of course, I’m hoping that Della just needs a little time to catch her breath after the delivery. Nita, my heart is with you right now. I’m so sorry for all of this pain. I know you’ll make the best decision for everyone (including Della and Jane) that can possibly be made. Della and Jane are incredibly lucky that they have you for protection and support. I know you are giving them much, much more than most could even begin to understand how to do. Blessings & strength be with you, your family, and Della and Jane. Thank you for sharing what you do. I respect your privacy and decisions, and they have taught me so much that I’d never know as someone who has never had my meat and dairy animals to raise and care for myself. It may sound trite, but I really need those valuable perspectives you give. Thank you for taking such good care of all your cattle and animals, and we send welcomes to all the newcomers, and best wishes to you in your job (and theirs) ahead as your other mamas are due to deliver. We appreciate you so much…! I raise Jacob sheep, we breed and lamb on our ranch. We also have a young Holstein calve we raise. I completely understand the emotional/financial/personal tie one has to the animals. I had a Jacob ewe who took three years before her first lambing, I was told I was “crazy” to even breed her because she was born crippled, but learned to walk shortly after her birth. I had to give her the chance to breed, see if she could before making a decision to cull her. She did in fact take this past breeding season and gave birth to an 11# ram lamb, however, it was a very difficult delivery and we almost lost her. On the upside, she now has her own baby, she will never have another. I spin my own fiber from my sheep, she has some of the most gorgeous fleece in the flock, so in that respect, she will remain with me (she and her son) for the duration of their life………….sometimes just loving them is enough! I am going to think positive thoughts about Della getting up. Jane is one sweet baby! Oh, my heart breaks . . . for you. First that you have to go through this, especially with this particular cow, but mostly because you have to do it in such a public fashion. I hope you can feel the support from your followers. What would tip the balance for you? You’ve already passed the production cow cull point; it seems like what you’re doing is starting heroics — what’s the next level that would cause you to make the decision? Bruce, yeah I passed the production cull point when I decided to keep her after the last birth. Now it’s too late since they have to be ambulatory to be able to be shipped. My personal definition of heroics would be having the vet out constantly, lifting and putting in a sling among other things, others may have a different view. As long as she is eating, drinking, pooping and peeing and showing a will to live, I don’t mind meeting those basics needs. At this point I can still milk her some for her calf, as you know milk replacer isn’t cheap, so some TLC, and tincture of time and we’ll see. If she gives up, that is when I will make the decision. With that in mind, that is why she is outside, not in a stall, and also why I tell people when they ask me how big to build a gate in their new barns, I tell them make sure you can drag a dead cow through it. I truly do feel for you. 😦 I don’t have cows because I can’t afford cow safe fencing right now, but I do have a few goats, and I absolutely have a good relationship with them. I DO consider myself a bleeding heart (It’s so hard to say “no” to a pair of sad eyes, regardless of species. I have two cats… I don’t even like cats. ) but there is a HUGE difference between fanaticism and being humane. I will do everything within my practical power to do the best for an animal in need. But several facts will always remain true – You can not save them all. Suffering trumps existing. Existing is NOT living. If you can not sustain yourself, you cannot sustain an animal. I do feel for you, it is always so difficult to manage in times like these. Just be mindful of one thing if you intend to maintain Della like this; urine. That sounds silly, but I was working at a dairy near me and they had a goat down. They decided since she was eating and drinking they’d let her be. Even though she was 100% paralyzed from the neck back, dropping weight rapidly, and obviously miserable. She lived for several weeks like this until they decided to build her a sling to “get her standing”… the back leg that she’d been laying on was BALD and covered in ammonia burns from her own urine. It was very, very, very painful for her, with open wounds and everything. JUST from laying in her urine. If you can, please be sure to move her as often as you can, and once a day go out with a warm damp soapy towel to give her legs a rub down so this won’t happen to her. Adjust her legs if you can at least once a day to prevent bed sores. I hope she gets up for you. Her eye looks pretty good and it might just be something like a pinched nerve. We had a range cow down for about three days that didn’t appear to have any reason for doing so and she got up and all was well after a shot of azium to reduce the inflammation. Just a smart guess on our part. I heart Jane too! Additional thought. On the farm we occasionally had cows down with pinched nerves after calving. It took one cow almost 2 weeks and then she hopped up like nothing ever happened. It’s when they have no interest in eating or drinking that it’s time to give up hope, dig a hole and put them down. i like what I have been reading on your posts. I have been doing rotational grazing for 10 years and always enjoy finding out about others doing the same. I sympathize with you on having to make the right decision about keeping Della. We have a problem cow too she has had two calfs and now will not breed back and has something wrong with one of the quarters in her udder so we do not plan on having her around much longer. It will be sad to have to eat her but like you said this is what buying your meat from the store insulates you from. Thank you for keeping us updated, I’m praying for Della. I use newcells injection when a animal is down or feeling bad, it really helps, thought I would mention it. I have used it on my sheep and cows. ‘My’ poor Della. I didn’r realize the events that have unfolded. I dont know much about cows. Re-reading and now realizing, wow….this is a hard one. In the last 3 years of being a weekend farmer, I lost 2 sheep, 3 peacocks and numerous other fowls. The worst part is…a sense of helplessness into what to do to mitigate their sufferings. I went from all organic to very invasive..pain-killers, steroids, wormers, antibiotics…whatever can help. I dont know the circumstances….would Banamine be helpful in this case? I nursed (God had decreed life of course) a ram back to life after it started floundering and the vet had given up on it. My thoughts and prayers are with you and Della. May there be a miracle and Della comes around. God bless! I hope Della turns around for you. 😦 You will do the right thing for her no matter what that ends up being. On a happier note, Jane is very cute. Oh, my heart goes out to you. Thank you both for being a responsible steward, and for sharing your experiences with the world at-large. Praying and hoping she is up by now!!!!! Jane is beautiful! Life, in all its beauty…..cannot be separated from imperfection and its consequences. Your frank thoughts about this moment in Time for you and your family is such an important gift to your readers. Thank you for your truthfulness and wisdom.